After School Chess Teacher – We offer flexible schedules, good pay and excellent training for new chess teachers. We are a well established nonprofit organization based in Northern California that offer our teachers good pay, fun assignments and opportunities for advancement. The Torres Chess And Music Academy has instructed several individual National Chess Champions as well as coach for the Mission San Jose Elementary School chess team, which in 2009, 2013, and 2015 took first place at the USCF Super Nationals Chess Championship. The TCAMA also regularly organizes/hosts events for World Champion chess players, Fortune 500 CEO’s and celebrities. Working with us means joining the winning team! The Job Position: We’re looking for individuals with strong people skills, experience with children, knowledge of chess and strong organizational qualities. Our teachers must be on time, provide a safe learning environment, follow our lesson plans, keep records of attendance, act professionally at all times and have fun interacting with our students. The Location: The TCAMA has immediate openings in the Cupertino/Los Altos area and potential assignments elsewhere in the Bay Area. The first obvious requirement for earning money teaching chess is that you need to be able to play chess well. This of course doesn’t mean that you have be a grandmaster level chess player but you do need be able to teach from a position of authority which means that you should at least be the equivalent of a 1500 ICC rated player. The other half of the equation is being able to teach. I consider teaching chess to be an art form in and of itself. The best way to learn this art, is to sit in on the classes of other successful chess teachers and take notes on their lesson material and delivery. In order to “get paid,” you’ll need to find students. The easiest way to do this would be to contact local scholastic chess organizations. You can find these by attending scholastic chess tournaments in your area and talking with the coaches of large teams. If you are confident of your chess skills, you can volunteer to go over games in the team rooms of these groups and who knows, you might land your first job or pick up a private student. Far and away your best source of students will be “word of mouth” recommendations but you will also want to consider starting a website or blog to get your name out faster. Offering free learning material on a professional looking site will impress any prospective students who are cross referencing a friend’s recommendation. In addition to learning material, you should also list locations where you are holding classes and tournaments you will be attending. This way, possible students can come and see you in action before registering for a session of classes. Making a strong connection with your students is a must for any successful teacher. For chess instructors, this means remembering that the kids sitting in front of you are actual people and not little robots. Your students need to see that you genuinely care about them and their progress. In addition, you need to be there for them when they win first place or when they have a bad tournament. Being totally committed to every student’s progress is difficult work but without your commitment you will not gain their loyalty. The fact is that parents will be expecting to see good results from their investment in lessons with you. For gauging improvement, they will be looking at their child’s rating changes and tournament results. Since kids don’t improve in a linear fashion, this means that there will be times where the child shows little improvement for a couple months followed by a sudden rapid improvement in understanding. During the slow growth times, it is important to give honest assessments to the parents and stay positive with the child. Failing to do both will likely result in losing a student just before his/her next period of growth. The best advice I can give to new chess teachers is that they need to enjoy themselves while teaching chess. Chess is hard work and it is vitally important for a coach to keep the “fun factor” in the game. Without a genuine passion for chess, teachers can not expect their students to enjoy the learning process. If you don’t enjoy the game of chess and working with children, being a chess coach is not a good career choice. Remember, the most successful professional chess coaches haven’t become so through luck. They have spent countless unpaid hours analyzing chess games, answering emails and offering their services at chess tournaments. If you are not willing to go “all in” for your students and business then you can’t expect to support yourself through chess. However, if you consistently try your best for the kids you serve and use common sense in managing your business, teaching chess can be a fun way to earn a living. Besides myself, there are several other accomplished musicians who have a real gift for teaching chess. Many of these multi-talented individuals already work for the Torres Chess and Music Academy. One who does not yet work with us but I am definitely keeping an eye on is Nephtali Diaz. 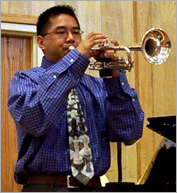 Mr Diaz is “Houston’s only chess and trumpet professional,” which makes City of Houston very lucky to have such a talented individual in residence. Neph is a regular at Houston area chess tournaments and has paying trumpet gigs several times a month. Besides being accomplished in both chess and music, Nephtali has carved a niche in teaching a chess variant known as bughouse. The starting position in a Bughouse Chess match. For the uninitiated, Bughouse is an extremely popular team chess game played with two boards and four people. 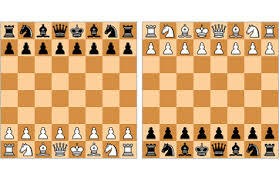 Team mates sit adjacent to each other with one one partner using the white pieces while the other partner plays as black. When your partner captures a chess piece, he/she places it in front of your board and you can decide whether or not you want to place it on your own board as a turn or save it for later. If you chose not to “drop” the gifted piece you then must play a standard chess move. The action on both boards stops as soon as one player is checkmated. Planning to play in the 2014 U.S. Junior Open or Not-A-Junior Open happening very soon in Houston July 11-13? Take a break from regular chess and drastically improve your Bughouse game by attending my power packed Bughouse seminar on Sat. evening and learn the SECRETS to becoming good at Bughouse while also improving your chess tactics! As a multi-national champion on the game including lectures at many chess events (including the 2014 American Open) and national lecturer featured in Chess Life magazine, it’s also an excellent way to prepare for the Bughouse tournament on Sat night. Visit my website for more info:www.BughouseMaster.com — Sign up for my lecture takes place on site and the lecture is from 530-630P Saturday, right before the side events — see you there!! Register for main event below. Beginning May 11, Nashville Tennessee will host the 2012 U.S.C.F National Elementary Chess Championship. This is the paramount annual chess event for children ages 4-12. Below is a highly biased preview for this year’s event. The competitors listed in this article are all kids I have the pleasure of playing chess with on a weekly basis. What can I say . . . my job rocks! Collins Elementary first grader Milind Maiti possesses natural tactical abilities that are beyond anything one would expect from a player in high school! He is truly a chess prodigy of the highest level and will be a contender at the 2012 National Elementary Chess Championship. MSJE kindergartener Kevin Pan is a rookie at this year’s Nation Elementary Chess Championship. Fresh from a State Championship win in California, Kevin is poised to make a big statement in Nashville. MSJE student Rishith Susarla was nearly perfect at the USCF National k-12 Championship in 2011. If you talk with Rishith one of the first things you will notice is how quickly he speaks. When sitting across the chessboard from him, I often feel that he calculates much faster than the computer Deep Blue. I first got to know Edwin Thomas (MSJE) at last year’s chess camp I ran at Mission San Jose Elementary School. Edwin progressed from a rookie to a trophy winner in just a few short weeks. Amulya Harish (MSJE) and his father always seek me out at the local tournaments for extra instruction. I have no doubt that with his dedication he will quickly excel. Rounding out the field for the fabulous MSJE K-1 chess team is Annapoorni Meiyappan, Aarti Abhijit Sant, and Stephen He. Luke Zhao is a third grader at MSJE and the only child from that school to be an official member of the Torres Chess and Music Academy All Star Team for the school year 2011-2012. Luke has played an important role in several successful championship runs for the MSJE team. Now he seems ready to play for his first individual championship. Watch out for John Chan (MSJE) who recently claimed the title of K-3 champion at last month’s CalChess Scholastic Chess Championships. Second grader Soorya Kuppam (MSJE) is my favorite opponent on Monday nights. It’s hard to believe that he has already been competing in chess for three years. Don’t let Mihir Bhuptani’s (MSJE) quiet personality fool you. His crushing tactics are comparable to a rock concert. Tommy Koh has played in integral roll in several MSJE championship victories. The final touch to the MSJE powerhouse this year is Jeffrey Liu. Ben Rood was also a part of the Torres Chess and Music Academy All Star Team for the school year 2011-2012. Ben has already won several National and State Championships and is playing the best chess I have ever seen from a second grader. Fresh off his k-5 State Champion win in California, this second grader is ready to win at the national level again. If Magnus Carlsen is the Motzart of Chess then Ben Rood is definitely the Beethoven. Sadly, MSJE was unable to bring a full team to the K-5 section this year. Despite being a player down, I am sure that the kids who were able to attend will give a phenomenal effort. The first member of the K-5 MSJE Team is Amit Sant, of whom I am a huge fan. Drake Lin has grown from a nominal player out of dozens to a key player at MSJE over the last several years. Finally, we have Anjan Das who is attending despite his extremely busy schedule of other extracurricular achievements. We can only say that while we only have four competitors for our MSJE K-6 Team, these are the four kids I am most glad to see attending. Eric Zhu is the first kids at MSJE to ever defeat me in a chess game. Alvin Kong is so eager to play chess he often arrives to chess class before any of the coaches and always gives Coach Joe Lonsdale the most trouble in their weekly skirmishes. Sayan Das, Anjan’s elder brother, is similar to his brother in his prolific talents in all areas, especially on the MSJE Team. Finally, Shalin Shah is not only one of my favorite opponents, but one of my good friends. I look ahead with regret at the loss to MSJE as he and the other K-6 competitor’s graduate onto the seventh grade and greater challenges. I would like to add that we will be losing one other key asset to the MSJE Team as our sixth graders move ahead. Nimish Shah, Salin’s father, was a fantastic and devoted volunteer every Monday at MSJE. I have great respect for his dedication to his son and the MSJE chess Team. It is a distinct pleasure to have played a role in all of these wonderful children’s chess development. Unfortunately, I will not be at this year’s tournament as I must stay home to help my pregnant wife. Yet I know that Coach Joe Lonsdale will successfully lead our Northern California Chess Competitors to victory. Check back daily for more updates on the exciting events from the 2012 National Elementary Championship.